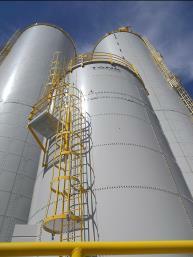 Bulk storage tanks – raw materials or finished product. Airdusco can assist. 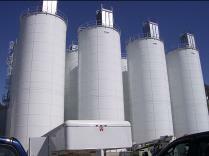 Bulk storage tanks – raw materials or finished product. Airdusco can assist. For our customers who require bulk storage of raw materials or finished product we can help you select the best storage tank solution for your needs. As a representative of the Tank Connection we can help you select the best storage tank or silo option for your process. 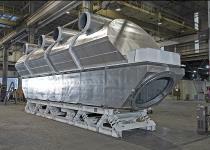 Options include: bolted tanks, shop welded tanks, field weld and hybrid storage systems. To help you complete your storage system we can help you arrange field installation and supply any auxiliary equipment you might need. For the most energy efficient method of drying or cooling a continuous flow of bulk material consider Carrier Vibrating Equipment’s line of vibratory fluid bed dryers & coolers. As energy costs continue to rise, fluid bed technology is far less costly to operate than traditional rotary dryers. 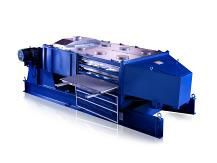 In addition Airdusco handles their complete line of vibrating conveyors, vibratory feeders and vibratory screeners. When the efficiency and accuracy of your screening and separation equipment is important to you, contact Airdusco. As a Rotex® representative we offer best-in-class screening technology for dry material screening for chemical, food, grain, minerals and sand screening applications. From a single deck machine to scalp overs to a multi-deck, high capacity unit for precise material separations, contact us. Vortex Shifting Powder-The advantages of using air-gravity conveyors. © 2014 Airdusco Engineering & Design Services, LLC. All Rights Reserved. Designed by LunaWeb - a Memphis web design, SEO and social media company.